From the Outaouais River to the Rocher Percé and from the USA border to the Arctic, all along the shores of the Majestic St. Lawrence River, Quebec hides dozens of colorful, picturesque cities and villages. Between these quiet villages and the bustling cities, the visitor discovers the true meaning of these legendary wide open spaces. Discover Quebec's numerous national parks, well-kept treasures that turn out to be magnificent for those who dare reveal them. Hidden Trails offers a great selection of horseback riding vacations in the Province of Quebec, so you can truly experience the hospitality and culture of French Canadians. 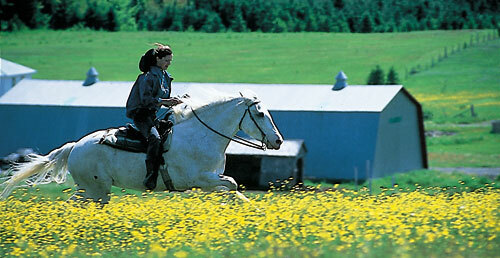 Our Appalachian rides, located south-west of the historic city of Quebec, offer a variety of horseback adventures - all offering an excellent Quebecois cuisine, satisfying the gourmet in you.